It's Tom Heck with your May 1, 2007 edition of the TeachMeTeamwork.com Teamwork Ideas e-Newsletter. I recently watched a documentary I MUST tell you about. It's entitled The Heart of the Game and was shot over the course of 6 years. The film follows a college tax professor who has a side job coaching a high school girls basketball team in Seattle, WA. This true story is almost too amazing. A team of Hollywood writers couldn't have come up with a story as good as this. If you work with teams you must watch this movie. If you work with kids you must watch this movie. And while I'm on a roll with movies - - another must see film is "Freedom Writers" which is a Hollywood movie based on the true story of a truly wonderful high school teacher. In each of these movies you'll see people who hold themselves and their teams to very high standards. Standards is what this week's TeleSeminar is all about (read more below). Standards refer to the behavior and actions to which you are willing to hold yourself accountable. Simply put, your standards are how you’ve chosen to behave. A team can only produce quality goods and services in a sustainable way when team members have high personal Standards. CLICK HERE to learn more and register for this FREE TeleSeminar for leaders, coaches, and managers. Open Space Technology Expert Michael Herman shares how you can use this amazing approach to tap into the genius of your team. CLICK HERE to access the audio. Join My Team -- Are you a fit for my team? Guest Bloggers of TeachMeTeamwork.com -- Are you ready? Activities for Professional Speakers -- I'm a virtual guest speaker! 25,483 subscribers as of this newsletter. Members in 101 countries (that I know of). CLICK HERE for a list of the countries. 152 affiliates worldwide. CLICK HERE to learn more about the TeachMeTeamwork.com affiliate program (I send affiliates money). Air Lock is a teambuilding activity that emphasizes communication, careful steady movement, and team coordination. This teamwork exercise is a "classic" get-your-team-from-here-to-there activity and is best left for groups that are patient. Do not attempt this activity with a rambunctious hyperactive group. When you become a member of the IATF you'll receive immediate access to our growing online archive of teambuilding games plus you'll receive many other benefits. CLICK HERE to learn more about the benefits of IATF membership. Raising Team Standards - - it’s the topic we danced around during the last TeleSeminar on “Extending Team Boundaries”. …some of the staff perceive they can set their own boundaries regarding the work they can do/should do and threaten grievances if those boundaries are crossed. For instance - "Jill" might decide she doesn't want to participate in a meeting, so calls in "sick" on that day, or any other day when she doesn't want to do something. This is NOT a Boundary issue. This IS an issue of personal STANDARDS. “Personal Standards” refer to the behavior and actions to which you are willing to hold yourself accountable. Simply put, your standards are how you’ve chosen to behave. The staff person mentioned above has placed their entire focus on Boundaries and completely ignored raising their personal standards. What will the team experience when team members raise their personal Standards? FACT: A team can only produce quality goods and services in a sustainable way when team members have high personal Standards. In this live (recorded live) and interactive TeleSeminar we explored personal standards and their effect on the team. What are your current standards? Are they high enough? Too high? How high should your standards go? What is the risk of setting high standards? Low standards? What is the relationship between standards and “Tolerations”? NOTE: The recording, class notes and resources are FREE to IATF members and are archived in the IATF Members Only Area HERE. On April 18, 2007 I was a virtual guest speaker on the Coach University Special Interest Group (SIG) monthly meeting of professional speakers. I was a "virtual" guest speaker because this group meets virtually using telephone conference technology that enables people from around the world to learn together in a live and interactive format. 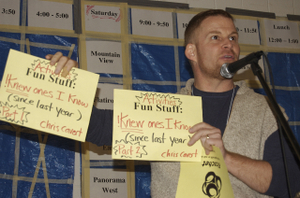 I was asked to share experiential learning activities that would help speakers engage their audiences like never before. I recorded the call and you can hear it now (link below). I started off the call with a true story about how I was asked to deliver the opening message at a regional conference of the Association of Experiential Education. The event planners wanted me to help conferees EXPERIENCE the power of coming together as community. I share how I used a simple to lead teambuilding game that had the entire conference on their feet, sharing ideas, and working together as a team. I also share how I worked with a professional trainer in need of an activity for his next multi-day workshop for auto mechanics. He wanted an experiential exercise that would grab the attention of this group of men. The activity had to set the tone for the entire workshop and act as a launching pad for all the content that followed. Towards the end of the call you'll hear me do some one-on-one coaching with one of the conference call participants who was looking for an activity she could lead in her next workshop. She wanted an activity that was quick and easy to lead (no props) and really drove home the importance of how we look at things (perspective). CLICK HERE to listen to this audio recording You'll be taken to a password protected "Members Only Area". Membership is free with your subscription to the free TeachMeTeamwork.com e-newsletter. Would you like me to be a virtual guest speaker for your group? Contact me. My friend Barry Rellaford of Speed of Trust points me to an article that addresses how to manage (lead) a team of tech experts who are dispersed geographically. As qualified technical experts are getting more expensive and harder to find, virtual teams allow organizations to attract and retain the talented individuals they need from a global pool. Managing these individuals remotely, however, presents managers with several unique challenges. In these situations, managers need all the traditional leadership skills the position requires, as well as specialized knowledge required to deal with remote teams. For example, good leaders have to be trusted by their employees. Here's a teambuilding game that gives people an experience of trust. The person running through the Trust Wave must trust the people in line AND the people standing in line must trust in themselves (to do their job correctly). The Team Build A Word teambuilding game is one of my favorites because this exercise creates so many great openings for powerful conversations about building high performing teams. It's Tom Heck with your April 16, 2007 edition of the TeachMeTeamwork.com Teamwork Ideas e-Newsletter. On Thursday this week I'm leading a TeleSeminar on "extending team boundaries" and I've had several people writing in asking questions about this topic. One person who works in a public school understood how extending boundaries works in the for profit arena but wanted to know if it's possible to extend boundaries in a school setting. The answer is a resounding YES and the results are amazing when the school community (teachers, administrators, support staff, students, parents, community members, etc.) learn the value of extending one's boundaries. It will literally transform the school. Look for a post later this week where I'll be sharing an audio interview with a company president who extended boundaries organizationally and reaped the rewards. Toobeez Robot Writer -- Write on! A fantastic new book is out by Chris Cavert, Sam Sikes, and Faith Evans entitled "The More The Merrier -- Lead Playful Activities With Large Groups". I consider this book a MUST HAVE for anyone leading teambuilding games. I discuss the book with master teambuilding games leader Chris Cavert. CLICK HERE to access the audio. BYOBW -- A race I want to participate in next year. Throw out your TV -- So you want more time? 25,159 subscribers as of this newsletter. NOTE: I've purged over 6,000 emails from my list in the past three months. The emails were either being identified as spam OR the subscriber didn't click on the opt-in verification email that is sent immediately after subscribing. Make sure you add my email address ([email protected]) to your spam filter's white list and look for the opt-in verification email to avoid removal from the list. This is a Toobeez teambuilding game. Toobeez were oginally designed as a giant construction toy for children but it turns out they are perfect for leading over 25 teambuilding games with children or adults. Use a set of Toobeez to build a Robot Writer and then stick a magic marker in the center of the hub. Tape a piece of paper on the ground and ask the group to draw a message on the paper using the Robot Writer. Debriefing / Processing topics to discuss: What is the message we are sending (communicating) as a team? CLICK HERE to read complete lead-it-yourself instructions. You will be taken to a password protected "Member Only Area". Membership is free with your subscription to the free TeachMeTeamwork.com e-newsletter. It's great fun to use stilts in a teambuilding game. Every group seems to have someone who can walk on stilts. I find this amazing. This activity lends itself to discussions about achieving success as a team and completing a “journey” as a team. Prior to starting the activity you might ask the group to identify and clarify their vision. Ask the group to write this vision on a large foam core board and stand it up on the other side of the river. Tell the group there job is to reach their vision. Before allowing them to start, have the group identify all the obstacles (in real life) that make it difficult to achieve their vision - - write these on index cards and place them in the "river". The metaphor is now set up. The Channels teambuilding game requires the team to "transport" marbles from point A to point B. This is a great team exercise if you want to help a team explore issues of "product delivery" (to the customer, etc.). The setup up is critical in that the distance between points A and B must be greater than the combined length of all the "channels" laid end to end. I try to make the transport distance at least double the length of all channels. This will require the group to "leap-frog" each other while the marbles are moving. There are a few other important rules you'll need to follow to make this work (see below). NOTE: The team in the video is violating a big rule - - can you guess which one? I used to cut PVC pipe in half length wise to make my channels but now I use a much better material. See the link below to download "make it yourself" instructions. Here's a funny video clip of musicians Igudesman and Joo of A Little Nightmare Music using teamwork to play a piano piece that requires "big hands". Duct Tape is one of my favorite all purpose tools. You can fix nearly anything with it AND you can lead lots of fun teambuilding games with it! Here's a teambuilding game called "Trolleys" that is normally done using two long wooden boards. The team stands on the boards and then each team member holds onto a rope attached to the board. Wooden Trolley's are fun to use but they are inconvenient to transport due to size and weight. CLICK HERE to learn all about our book "Duct Tape Teambuilding Games - 50 Fun Activities to Help Your Team Stick Together"
Bloggers Needed -- Would you like to be a guest blogger at TeachMeTeamwork.com? Would you like to be a guest blogger at TeachMeTeamwork.com? 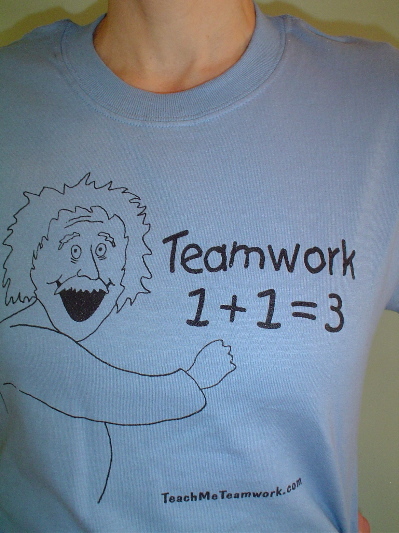 I'm looking for people who want to write articles on teamwork related issues and then post them at TeachMeTeamwork.com. You get the credit on the post. The post contains a link that points to your site - - an advertising opportunity. Exposure - - I have 25,087+ subscribers (as of April 12) and writing for my blog can help increase your exposure. 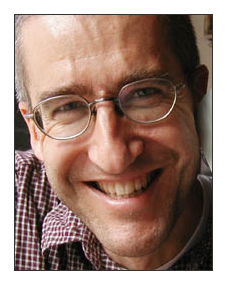 Camaraderie - - You get to hang out (virtually) with movers and shakers (people just like you). Are you interested? If yes, send me an email with a sample article/post and let's start the discussion. Two years ago we got rid of our TV so we could make room in our lives for more important things. The average person watches approximately 35 hours of TV each week - - that's nearly a full time job just watching TV! What would you do with an extra 35 hours each week? I built a Floating Arm Trebuchet with my son. You can watch a video of us HERE launching golf balls 100 yards in a field. Look at stuff in a microscope. Play Bocce Ball in our yard. I still rent a DVD now and then and watch it on my computer. I love documentaries (have you seen "Riding Giants"?!). And my son will watch a DVD once every week - - currently he's enjoying Johnny Quest and Bill Nye The Science Guy. A friend called a couple of days ago and he wants to make big changes in his life. And yet, his life is so full that he doesn't have the bandwidth to create (or allow) those changes. I suggested he get rid of his TV to create more room in his life for things that really matter and he said "What?! I'm not going that far!" Who and what you surround yourself with begins to define you. Most TV is the equivalent of junk food. Do yourself a favor and throw out your TV. And if you have to get your TV fix then watch amazing and empowering stuff like the TED presentations. I subscribe to Make Magazine. When I receive a new copy in the mail I do back flips and read it from cover to cover. 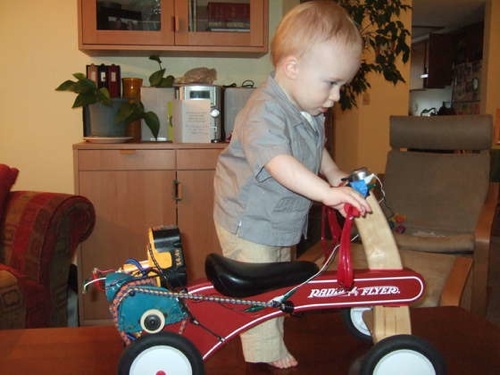 Check out this modification to a child's Radio Flyer Trike. An old power tool turns this human powered trike into a motorized version. I love it. (Yes, I know it's a little dangerous). CLICK HERE to read about this mod at the Make Magazine blog. 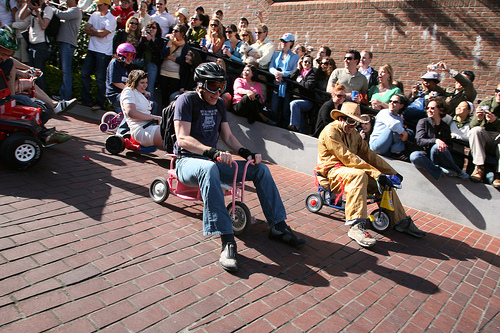 While reading BoingBoing I discovered the BYOBW race that is held each April in San Francisco. In case you were wondering, BYOBW stands for Bring Your Own Big Wheel. The race takes place on that crazy curvey road called Lombard Street. One of my favorite toys growing up was a Big Wheel so this means I'm going to HAVE to participate in BYOBW some day. CLICK HERE to view pictures and video of the 2007 BYOBW race. The Maze is an teamwork activity that requires the group to move from one end of the mapped out area (a tarp with squares in this case) to the other. The team is told their is one route through The Maze and they must figure out the path and get everyone through before time runs out. The route moves from one square to another and their are penalties for stepping on the wrong square. And to make it extra difficult, verbal communication is not allowed. It's a great activity filled with rich opportunities for debrief topics. And its an extra portable game - - always a plus for those who travel. 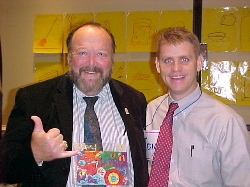 It's Tom Heck with your April 2, 2007 edition of the TeachMeTeamwork.com e-newsletter. For the past three weeks I've been leading a Manager As Coach TeleSeminar series for a company based out of India. This team I'm working with is spread out all across the US and several of the participants are calling in from India. To get this group together for a live-and-in-person (in one location) training session would be difficult and expensive. However, through the weekly TeleSeminar training format, participants get to learn in short 60 minute chunks and then have the chance to think about and apply what they're learning in between classes. And I'm available to the team via email and phone all week. We live in an amazing time! Consider enrolling your team in my latest TeleSeminar on Integrity. I'm building a team and I'm wondering if you are a fit for my team. Do you enjoy helping others? Are you a natural coach and teacher? Do you love building strong teams? Are you coachable and enjoy working on a team? CLICK HERE to learn about this opportunity. 24,788 subscribers as of this newsletter. NOTE: I've purged over 6,000 emails from my list in the past three months. The emails were either being identified as spam OR the subscriber didn't click on the opt-in verification email that is sent immediately after subscribing. Make sure you add my email address ([email protected]) to your spam filter's white list and look for the opt-in verification email to avoid removal from the list. 151 affiliates worldwide. CLICK HERE to learn more about the TeachMeTeamwork.com affiliate program (I send affiliates money).